NEW YORK, New York — The Brazilian affiliate of Armenia Fund continues to support major renovations at Yerevan’s Nork-Marash Infectious Diseases Hospital. The latest project benefiting the facility, the sixth such initiative sponsored by the Brazilian affiliate, will result in the reconstruction of the hospital’s Pediatric and Adolescent Infections departments. 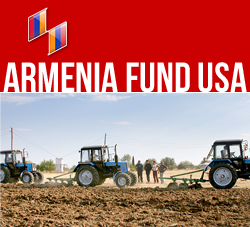 Currently under way, the project was announced by Armenia Fund, Brazil Chairman Ochin Leon Mosditchian in October 2009, during his working visit to Yerevan with a Brazilian-Armenian delegation. “This is not the first time when a benefactor finances several additional projects following the realization of an initial undertaking,” said Ara Vardanyan, Executive Director of the Hayastan All-Armenian Fund, commenting on the Brazilian-Armenian community’s consistent support of Nork-Marash Hospital. Since 2005, the Fund has implemented a string of extensive projects at Nork-Marash Hospital. They include the reconstruction of the Intensive Care Unit, Intestinal Infections Department, and Infectious Diseases Department, the installation of a new roof on one of the hospital’s two main wings, the installation of a heating system, and the construction of a boiler room. According to Dr. Asoyan, close to 7,200 patients (including 2,350 outpatients) have received care at the hospital’s renovated departments in 2009 alone.